The Stone Zone Show 2010 "Crack'A'Lantern Special #1"
The Stone Zone Show Season 8 HIGHlights! "How to make a Snow Bowl"
The Stone Zone Show "Web Chat FAIL"
The Stone Zone Show "The Puzzle"
Stoner Moments #11 -That was a Bad Idea! Curing the Blues! The Lost Recipe! Behind the Scenes of "Cooking with Dubious Pilot"
"The Extra-Special" Stone Zone Show S7E-Huh? The Stone Zone Show Season 2 HIGHlights. Stone Zone Show Special. "My Name"
"Stony Ride through Venice Beach" The Stone Zone Show video special! The Stone Zone Show "Internet Dating"
The Stone Zone Show "Zen Garden"
The Stone Zone Show Cypher -12- "Jankem Pop"
The Stone Zone Show Cypher -11- "Gobble Gobble..."
The Stone Zone Cypher -10- "A Cracka' look Backa'"
The Stone Zone Cypher -9- "Trick or Treak"
The Stone Zone Cypher -8- "The Haunted Cemetery, Stone Zone Style"
The Stone Zone Cypher -7- "Stoned Ghost Hunter Society"
The Stone Zone CYPHER -6- "Dubs Diablo"
The Stone Zone Cypher -5- "It's Harvest time!!!" Stone Zone CYPHER -4- "100 things to do when you're STONED"
Cypher-3- "What you rollin' with?" The Cypher-2- "Clean off your Cankles!" 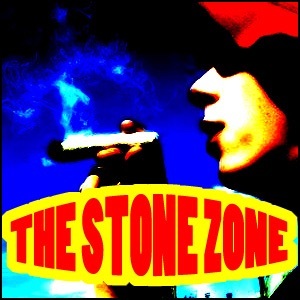 The Stone Zone Show LaborNight Special! The Marijuana Music Network SHOW 1. Season 2 Episode 5 "Classic SZS Re-issue!!!" Behind the SCENES--LAS VEGAS--420 special!!! Cacaquetes Caliente! Episode #3 Season 4.